PFAFF® creative™ Color Touch Screen – Our best ever! The 180º viewing angle ensures great visibility from all angles. The intuitive layout is easy to understand. See stitches in actual size and embroidery designs in true color on the clear, high resolution display – now with brighter color and higher intensity for maximum precision and ease. ActivStitch™ Technology – With three patents, this revolutionary technology delivers precise, gorgeous embroidery even when using challenging novelty threads like metallic. Sensors measure the fabric thickness to regulate the amount of thread needed to achieve perfect balance between the needle and bobbin threads. Results are perfect on both sides of the fabric which is ideal for everything from scarves to towels. The original IDT™ system – Integrated Dual Feed only from PFAFF® for over 40 years! A PFAFF® exclusive feature that delivers absolutely even fabric feed from both the top and the bottom, and ensures perfect seams on all fabrics. Custom LED lights – Optimized adjustable bright lights illuminate the entire work area with no shadows. Change color and strength for greater visibility. PFAFF® embroidery carrying case included – To carry and protect your embroidery unit. Increased Embroidery Speed – Now your PFAFF® creative sensation™ pro can embroider faster than ever before. With 30% faster embroidery speed* you will complete your embroideries more quickly maintaining the quality and precision that you expect. Cutwork needles included – Beautiful cutwork embroidery is completed quickly and easily with INSPIRA™ cutwork needles. Four different needles, each with a different cutting angle, cut the fabric as you embroider. Large Embroidery Area – The PFAFF® creative sensation™ pro sewing and embroidery machine features a large embroidery area - up to 360x350mm. Embroider your unique, personal creations in one hooping with the largest turnable hoop on market. More than 360 fantastic embroidery designs – Your PFAFF® creative sensation™ pro sewing and embroidery machine features a variety of specialty techniques. The built-in embroidery designs are grouped into three different categories, machine designs, mini designs and quilting designs. Shape Creator™ feature – Combine decorative stitches or design elements instantly to create truly unique borders and designs. Shape Creator™ Appliqué feature reinvents how to create appliqués with speed and precision. Choose from a variety of distinctive shapes – all built-in, like: stars, flowers, and letters. Precise Positioning feature – Place every embroidery design exactly where you want it. Easily match multiple hoopings to create embroideries of unlimited size. QuickFont Program included – Use your computer and QuickFont Program to create embroidery fonts from any TrueType® font. Program for Viewing and Organizing Designs – Organize design files saved on your computer, turn designs into image files, print catalogs and more. Ribbon Stitches – Add dimensional elements to your decorative stitching with beautiful ribbon stitches. Narrow ribbons and trims are woven into these special stitches as you sew. This unique technique was developed exclusively for the PFAFF® creative sensation™ pro sewing and embroidery machine. Patent pending. Large sewing space – The PFAFF® creative sensation™ pro sewing and embroidery machine is the perfect choice for quilters, home decor sewers, fashion enthusiasts – anyone who creates. The sewing area to the right of the needle is supersized for sewing large amounts of fabric or batting. Over 690 stitches – Including a wide variety of 9mm decorative stitches and Maxi Stitches up to 52mm wide. Combine and/or edit your stitches for even more creativity. Optimized Feeding – Enhanced to provide more control when sewing through thick layers or seaming small pieces. Exclusive Stitch Creator™ feature – Create new 9mm stitches or edit built-in stitches for unlimited creativity. Exclusive Stitch Creator™ feature – Create new 9mm stitches or edit built-in stitches for unlimited creativity. 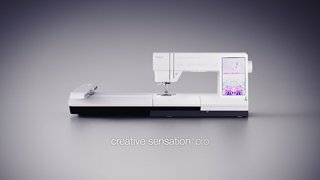 Straight stitch needle plate with sensor – The creative sensation™ pro is equipped with a sensor for the straight stitch needle plate. When the straight stitch plate is attached the machine is automatically set to straight stitch mode, preventing damage to the needle and the plate. Electronic Knee-lift – Raises the presser foot with an easy movement, allowing you to keep your hands on your project. Start/stop – Sew without the foot control; makes sewing long seams, free-motion and embroidery easy. 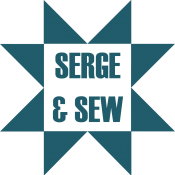 Needle up/down – Set needle to stop up or down in the fabric for pivoting, appliqué and more. Separate bobbin winding motor – You can easily wind a bobbin while sewing or embroidering, without having to unthread the needle thread. In addition to the 3 hoops included with the machine, the optional creative™ Grand Dream Hoop (350x360mm) features the largest embroidery area in the home sewing market. A truly versatile hoop – including difficult-to-hoop fabrics: the optional PFAFF® creative™ Metal Hoop (180x130mm). Just remove the magnets and effortlessly move the fabric. Our best in class embroidery software is the perfect complement to your PFAFF® sewing and embroidery machine; the possibilities are amazing! Create inspired designs on your computer and embroider them with perfection. Software packages are available for both PC and Mac® computers. PFAFF® Embroidery software for PC. TruEmbroidery™ Software for Mac® Computers.